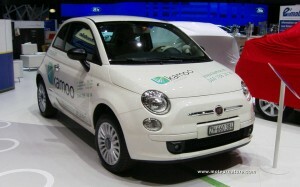 The Fiat 500 is one of Europe’s cutest car, it will come to the US next year, with gasoline engines. Americans will certainly enjoy it as much as europeans, as it is surprinsigly competent on the freeway. Not as good as a Mini, but still good, and much better that its small size suggest. That being said, it’s clear that the Fiat 500’s customers will be urbanites, from the hip and trendy group. An electric version would be appropriate. It doesn’t come from Fiat, but you can buy an electric 500 in Switzerland. It’s a conversion made by Kamoo, a small company that has converted gasoline cars to electric drive for several years. It started with the Renault Twingo, then the Fiat Panda, the 500 is its latest, and best effort. It’s a swiss car. With a swiss motor, and swiss batteries! These are Zebra batteries, warm batteries as many people call them in Europe, because of their high operating temperature. The electric Fiat 500 by Kamoo has a 30-kW (41-hp) motor, with 91-lbs/ft of torque. It gives the car a top speed of 68 mph, not enough for cross-country drives, but more than adequate for city errands. The battery capacity is advertised at 19-kWh, which should translate into 75 miles of normal driving. That is not much, but Switzerland is not like Texas. You never need to make long distances to go places. More worrying is the price of this electric 500. 61,480 swiss francs, that is $57,000! Very serious money for such a small car, but that is the price of individuality, and no-volume production. 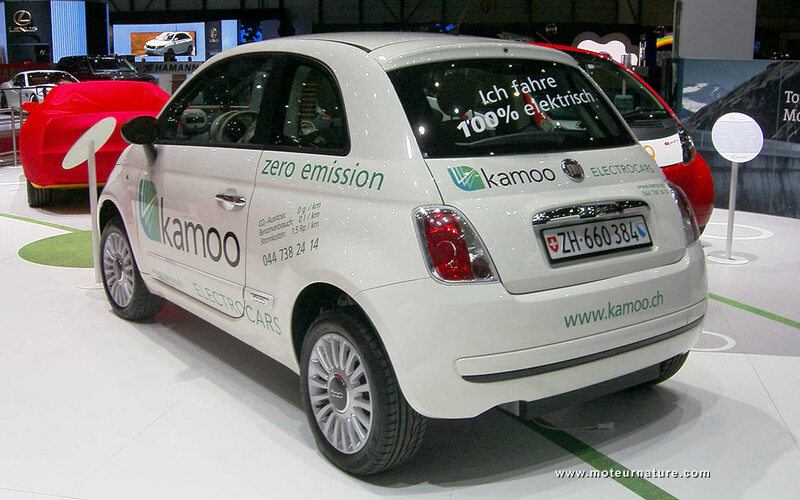 Kamoo’s cars are built to order, one by one. There’s hardly any economy of scale, so it’s very expensive. The Nissan Leaf promises to be much cheaper, but in the meantime, for those who don’t want to wait, an electric 500 is available today from Kamoo.